Cam Morrison was the Avalanche’s second-round draft choice, at No. 40 overall, in 2016. That was 30 choices after Colorado claimed Tyson Jost. They also were linked because at the time of the draft, both were headed to NCAA hockey to play for an “ND” as freshmen in 2016-17 — Jost to North Dakota, Morrison to Notre Dame. Two years later, Jost seems entrenched with the Avalanche after signing with Colorado following his single season at North Dakota. There were some rough moments for him in 2017-18, when it appeared at times he might have been better of staying at North Dakota for at least one more season of development. But there was no turning back. And he stamped himself as a potential future star. 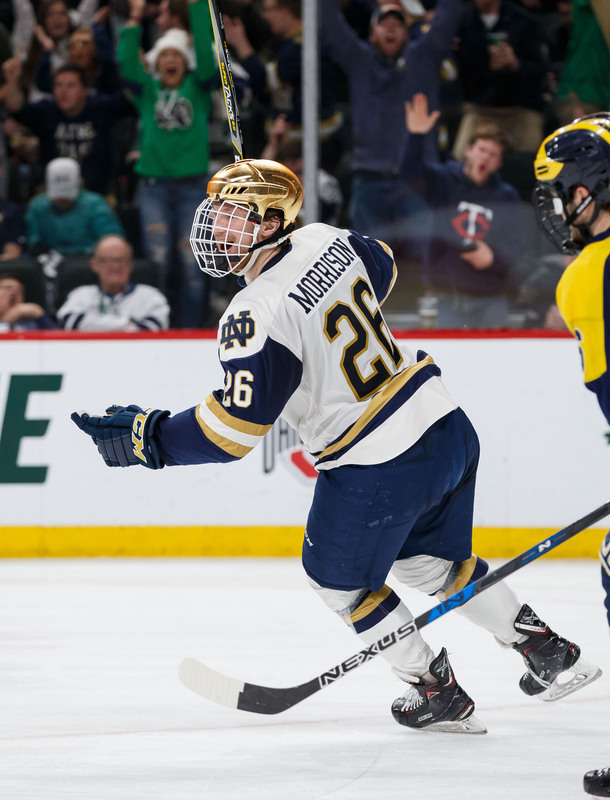 Morrison, meanwhile, is attending his third development camp with the Avalanche and is ticketed to return to Notre Dame for his junior season. 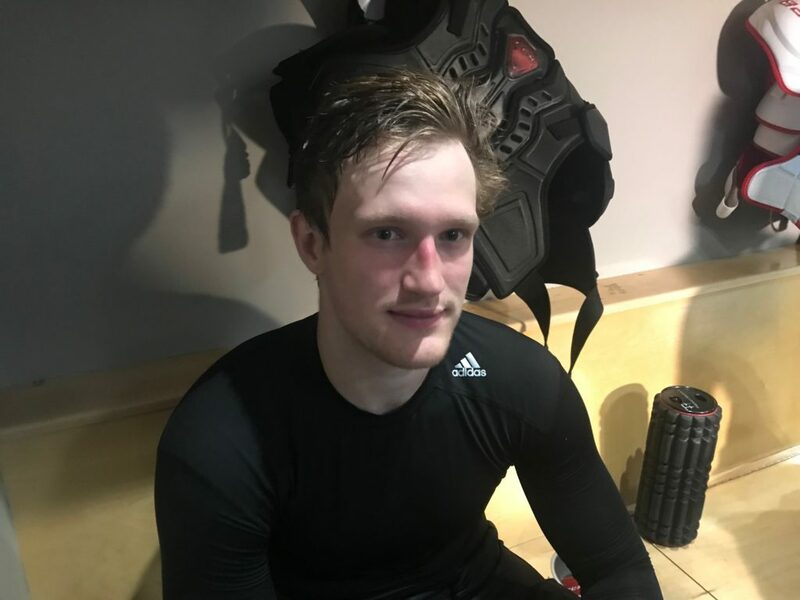 “I think Notre Dame’s the right place for me next year,” Morrison said in the Avalanche dressing room at Family Sports Center. “I still need to develop as a player and they as a school have all the tools I need to develop into the player I need to become to make that next jump. And the Avalanche’s stance on this? So the Avalanche will continue to watch Morrison and wait, and the only “deadline” is that if he plays a full-four season career at Notre Dame, he could becoming an unrestricted free free agent during the summer following his senior year. That’s the course DU defenseman Will Butcher, an Avalanche choice in 2013, took in signing with New Jersey; and the course Harvard forward Alexander Kerfoot, a Devils’ choice in 2012, took in signing with the Avalanche a year ago. In that sense, there will be pressure on the Avalanche to sign Morrison after this season. That is, if they think he’s still worthy of a three-year entry level deal as a second-round draft choice. Morrison is a 6-foot-3, 212-pound power forward from Aurora, Ontario, and played one season for the Youngtown Phantoms of the USHL before heading to Notre Dame. With the Irish, he had 12 goals in 40 games as a freshman and eight goals in 40 games as a sophomore. The Irish made the Frozen Four both seasons, losing to DU 6-1 in the 2017 semifinals and falling to Minnesota-Duluth in the championship game this year. “Going into college I was one of the younger players in the league,” Morrison said. “I got to see what it was like to play against older, more mature players. They were stronger and faster than what I was used to in juniors. I think it’s made me develop as a player. Morris still is only 19, and while he hasn’t signed, he has developed a familiarity with the Avalanche — and vice versa. “I’ve gotten used to the way they do things around here,” he said. “It’s totally a top-notch, the little details and drills and off-ice professionalism. It’s what they drill into our hearts and that’s the big key to being a successful organization.